Brazil Prima Qualita 17/18 Screen is a 3 bean blend from Brazil’s best growing regions –Cerrado, Otimo, and Minas and Santos. Santos is the name of Brazil’s largest coffee seaport city located in the state of Sao Paulo. Most of the coffee exported through Santos is actually grown in the state Sao Paulo and the neighboring state of Minas Gerais. These two states produce the majority of Brazil’s coffee. Brazil grows many varieties of coffee trees, but it is the Caturra variety that is the most popular because of its consistent good flavor, high yield and its suitability for mechanized harvesting. The Prima Qualita coffee are cured and processed by what we call the natural method. The harvested cherries are dried on huge patios the size of football fields and are then milled to certain specifications (bean size and lack of defects such as broken beans, black beans, etc.) The 17/18 refers to the screen size of the beans. Cupping Notes: Clean cup with sweet citrus (tangerine like) overtones. Heavy body, light acidity. Our single estate Costa Rica “El Tigre” is a Vournas Coffee Trading exclusive, and a long-standing company favorite aptly named after our mascot and logo. The El Tigre is graded SHB/EP and produced by two wonderful, multi-generation coffee familias. The farms are located northeast of Costa Rica’s capital city San Jose, high up in the volcanic mountains of Heredia and Barva. This area is also part of Costa Rica’s famed Central Valley coffee growing region. Our El Tigre is comprised of mostly catuai, caturra and typica varietals. It is washed and wet milled on site at the family’s private mill in Barva, and either sun dried or mechanically dried depending on weather and precipitation. The dried beans are safely stored in the parchment until the exact time it’s ready to ship. Then and only then is the parchment removed and the coffee prepped and sorted for export. Keeping the parchment on the green up until its point of export helps to retain moisture content, preserve acidity and protect unique varietal and farming characteristics, all of which are reflected in our cupping and quality scores. 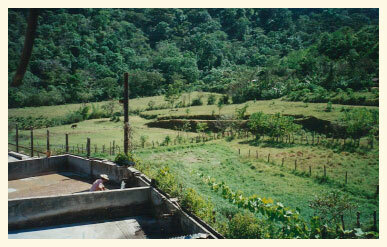 We are very proud to say that we have been working with this Costa Rican family estate for 25 years. In that time we have built a wonderful, long-term relationship that provides us with the opportunity to market their fantastic coffee to our roasters. Cupping Notes: Crisp, clean, bright acidity, a good snap, flowery (almost lemony) citrus with a slight hint of nuttiness in the finish. Say hello to a Vournas Coffee Trading exclusive, our Guatemala Huehuetenango SHB “Dulce Leonarda” from the Gustavo Mauricio Tello family estate located in the La Libertad region near the small village of La Mesilla. In our opinion this is one of the top Guatemalan coffees currently available, and in the 10 years since we first started carrying it, it’s become a staple and a favorite among many of our roasters. The cup is syrupy-sweet with subtle nuanced flavors, harkening back to the old days if you recall, when Guats could be profoundly interesting and clean with a smooth mouthfeel, good acidity, great body and profound sweetness! There are hints of caramel, cocoa and tobacco, a nice lemony-citrus acidity and a lingering, floral finish. The estate’s farmlands cover roughly 590 acres and vary in elevation from 5,000 to 5,400 feet, making this a true SHB grade (Strictly Hard Bean) Guatemala arabica. The family produces an assortment of 100% shade grown Bourbon, Catuai and Caturra varietals, handpicks their cherries and operates their own wet mill right at the farm. Parchment is transported to the exporters dry mill located in Escuintla, where it is brought down to its green state. Annual yield for the Dulce is only about 1,000 bags per year and you can only get it here! For 10 years we’ve been honored to be the exclusive purveyor of this coffee, produced by this distinguished Gustavo Mauricio Tello family of coffee farmers. We think it shines as a medium roast, but you decide…old time Huehuetenango is back! Huehuetenango is one of Guatemala’s 22 departments and one of eight different coffee growing regions, as defined by Anacafé or the Asociación Nacional del Café, which was formed in 1960 to represent establish a national coffee brand and represent growers. The region shares part of its border with Mexico and occupies roughly 2,800 square miles of the country’s western highlands. The land is diverse in geography and climate, encompassing a wide variety of tropical lowlands and mountain peaks. Huehuetenango is home to over a million people, most of whom are craftsmen or farmers who produce a number of crops such as coffee, wheat, potatoes, sugarcane, tobacco and barley. Although coffee remains the strongest and most valuable crop, there is still room for economic improvement as there is a reportedly high occurrence of regional poverty. For our part we provide coffee premiums to the Dulce growers, and all of our producing partners, that are well above market price or even Fair Trade recommendations. Cupping Notes: Great aroma, very clean, smooth mouthfeel, a nice syrupy-sweetness, medium acidity, great body and notes of caramel, cocoa, tobacco and lemony-citrus with some floral hints on a pleasant, lingering finish. Chiapas as whole is well suited to produce an almost Guatemala-like coffee, that is to say medium in body, medium in acidity (although not as much as the Guatemalan Huehuetenango), and with light hints of an oak-like woodiness and some spice. It is a very versatile coffee that can be blended, roasted dark or light, and roasts up nice and BIG! 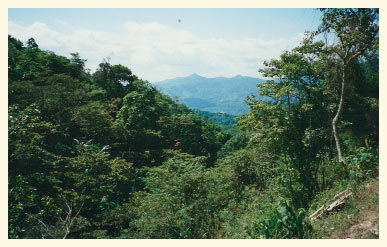 The lot is shade grown and High Grown (HG) in the southern mountains of Chiapas outside of Soconusco. The growers produce a variety of Bourbon, Caturra and Catuaí varietals and transport their parchment to the wet mill in Tapachula. Chiapas coffee is a fantastic all-purpose addition to any menu—over the years it has been one of specialty coffee’s best kept secrets! Chiapas is the southernmost region in Mexico, sharing a border with Guatemala to the west, and Oaxaca to the east. Mexico as a whole is the world’s 8th largest producer of coffee, with the majority of production occurring in Chiapas and Oaxaca. The mountainous highlands of Chiapas provide an ideal climate in terms of temperature and humidity for arabica cultivation; it’s also home to some breathtaking vistas and numerous ancient Mayan archeological sites. The United States is the main buyer of Mexican coffee, consuming nearly 80% of the green produced here. Mexico has been producing coffee ever since it was first introduced to the Veracruz region from Cuba in 1790. Cupping Notes: Medium body, medium acidity, hints of woodiness and spice, chocolate finish. This is a Vournas Coffee exclusive and perhaps one of the most underrated and undervalued coffees in all Central America! It is Strictly High Grown (SHG) by 3rd generation farmers, Delmar and Fernando Moreno Guillen, on their family estate high up in the Chiapas mountains. The farm utilizes a significant amount of natural shade trees, and while not certified organic, it is naturally grown and processed without chemical fertilizers. 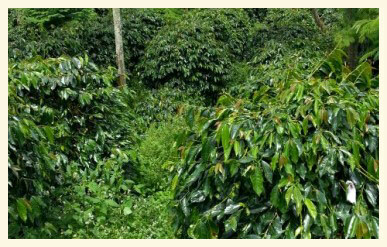 The varietals are mostly Typica and Bourbon, but there are a few Caturra trees still producing in some areas of the farm. Our Rancho has become one of our marquis, staple coffees and a favorite amongst our roasters ever since we first began offering it over 14 years ago when we first established Vournas Coffee Trading. Overall it’s one of the most versatile coffees around; it can be roasted across the spectrum, blended, or enjoyed as solo cup or single origin espresso. The beans are relatively softer than other high grown centrals and develop a bit faster in the roast, coming out looking nice and BIG! Chiapas is the southernmost region in Mexico, sharing a border with Guatemala to the west, and Oaxaca to the east. It is well suited to produce an almost “Guatemala-esque” profile; medium body, medium acidity (although not as much as a Guatemala Huehuetenango), a nice oaky, nuttiness and a hint of spice. Mexico as a whole is the world’s 8th largest producer of coffee, with the majority of production occurring in Chiapas and Oaxaca. The mountainous highlands of Chiapas provide an ideal climate in terms of temperature and humidity for arabica cultivation; it’s also home to some breathtaking vistas and numerous ancient Mayan archeological sites. The United States is the main buyer of Mexican coffee, consuming nearly 80% of the green produced here. Mexico has been producing coffee ever since it was first introduced to the Veracruz region from Cuba in 1790. Cupping Notes: Medium body, medium acidity, oaky notes, a slight nuttiness and hints of spice. 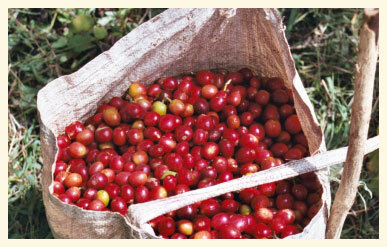 Our Kamarl A comes from high up in the Koban region, known for its ideal climate and high-quality Arabica. The majority of specialty coffee grown in Papua New Guinea is cooperatively grown by small farmers. Our PNG Kamarl A is an offering of small farm Bourbon and Typica, that when compared to other Indonesians is truly unique – exceptionally clean, sweet and with a more acidic profile than is typically expected. Here at Vournas Coffee Trading, we are huge fans of Papua New Guinea coffee, and of the many lots that we cup, the Kamarl A is among the best, on par with our co-op producers in the Eastern Highlands. The lot is pulped and dried in parchment then loaded on trucks to make the muddy trek down dirt roads to Goroka where it is milled, graded and bagged. Exporting is done through the Port of Lae, which is the country’s largest and busiest port. Coffee was first introduced to Papua New Guinea in the early part of the 20th Century; a rather late arrival when compared to neighboring islands. Coffee is deeply embedded within the cultural fabric of Papua New Guinea, where the coffee tree itself is often referred to as the money tree, and coffee beans act as a de facto currency, typically traded amongst the people as a staple commodity in exchange for virtually anything. Incredibly Papua New Guinea farms can accommodate two crop cycles per year due to its famously mineral-rich, volcanic topsoil and jungle climate. We have traveled the world over in our search for amazing coffee and it is our opinion that the farms in Papua New Guinea have the best soil, climate and overall growing conditions that we have ever seen; if you put seeds in the ground, it will grow whatever the crop! Somehow Papua New Guinea coffees have flown under the radar of American specialty coffee purveyors, although we suspect this will not be the case for much longer. Cupping Notes: Floral with a sweet orange-citrus, silky body, clean finish. Our Triple Picked Sumatra Lintong Tiger is 100% Typica and produced by a cooperative of approximately 120 small farm holders from the village of Saran Padang, located south of Lake Toba within the Simalungun Region. The local farmlands are well suited for the growing of coffee (and tea) due to the wet climate, high altitude and mineral rich, volcanic soil that covers much of the Island. Lake Toba itself is actually an ancient caldera that formed after the catastrophic volcanic eruption of Mt. Toba some 75,000 years ago. The Lintong Tiger is the highest grade of specialty coffee available from Sumatra: certified Grade 1, TP (Triple Picked), meaning it has been rigorously sorted by hand to remove any natural defects and ensure the best quality lots. Traditionally Grade 1 was the best possible grade of Sumatran coffee, however growth within the specialty industry and requests from specialty purveyors for even cleaner cups has resulted in the adoption of “double picked” and “triple picked” certifications to further enhance grading. At the mill, growers combine their yields and mill operators are then able to adhere to strict specifications on defects and bean size to provide the best quality Sumatran cups. Each farm averages 1.1 hectares with elevations ranging from 2,500 – 5,000 ft above sea level. When it comes to flavor profile, processing is paramount, and one of the main differences between Sumatra and other origins is just that–—Sumatra (and Sulawesi) growers are the world’s exclusive practitioners of the Semi-Washed / Wet Hulled (or Giling Basah) process. A chief characteristic of the process is the moisture content of the parchment at the point of sale – Washed or Wet Process coffees (which are the most common throughout the world) are pulped, fermented, washed and dried in the parchment until moisture content is reduced to approximately 10-12%, which typically takes about 12-24 hours. Conversely Semi-Washed coffees are pulped and dried for only a handful of hours until moisture is somewhere between 25 and 50%. At this point the parchment layer is still intact along with a good portion of the mucilage, causing the beans to be gummy and sticky if not outright slimy to the touch. With regards to flavor, the extra mucilage profoundly alters the cup profile by providing more sweetness and even body. In effect this makes the semi-washed process a sort of mid way point between washed coffees and naturals. In yet another departure from convention, the drying of semi-washed parchment occurs on natural clay or dirt patios where the beans freely absorb the characteristics and minerality of the soil, which in turn contributes greatly to the classic, earthy profile of the semi-washed. Moreover semi-washed beans appear to have a blueish hue and frequently curly shape when compared to other types of green, due to their unique processing and elevated moisture content. Sumatra and Sulawesi farmers traditionally sell their lots to local collectors who handle storage and shipment to the dry mill where the coffee is ultimately stripped of hull and parchment before being sorted and exported. In this way the farmers are able to receive payment for their crop much more quickly than if they were to use the more typical and time intensive washed/wet process. Cupping Notes: A nice, earthy and syrupy aroma, a creamy, big body with slight earth, and notes of dark chocolate with orange citrus overtones. Look for a substantial mouthfeel and a pleasant lingering finish throughout. Very little acid compared to Central American coffees. From Uganda’s Kapchorwa district, on the eastern border of neighboring Kenya, comes this high grown lot of washed, 100% shade canopy, mixed varietal, arabica. 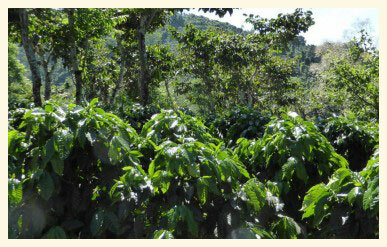 While the majority of the nation’s arabica is grown here on the slopes of Mt. 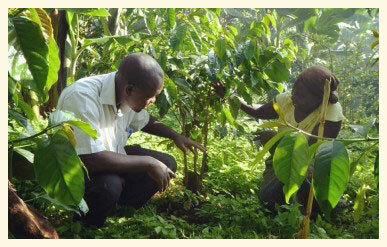 Elgon, the Kibale Forest on the country’s western border supports a substantial growth of native robusta. This coffee is grown by a group of small farm holders within the region. These farmers share access to a wealth of growing and processing resources including four greenhouses, an arabica nursery for adolescent saplings, and a washing station with eco-pulping capabilities. Banana trees grow alongside the coffee, contributing to the 100% natural shade canopy. Almost a thousand individual farmers contribute to the overall lot. 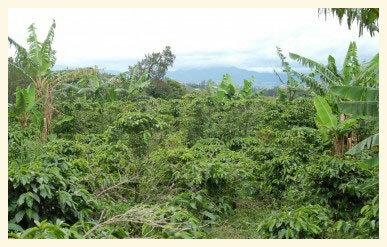 Each manages their own 1.0 hectare farm and is responsible for the production of about 1,000 arabica trees. In Uganda, coffee is the nation’s top grossing export, accounting for roughly 18 to 22% of all exports, and totaling 50 million US dollars annually. Tobacco and tea are the next closest exports with volumes in the 3 to 5% range. Cupping Notes: Spicy, citrusy acid and good body for an African coffee. Light, earthy and even woody flavors, but in a good way. Different than Kenya and other Africans – a very good coffee. Lighter roasts bring out a great floral aroma in the dry grounds.